In my quest to save precious tap water, I have set up my own Rainwater Harvesting Station. It is so designed so that any rain falling over this collection of plastic receptacles will automatically be contained, therefore being prevented from soaking into the ground. My theory is that 30 days of continuous heavy rain will produce enough water to flush the downstairs toilet 50 times. If we have some heavy snowfalls this should increase the volume of collected water, as the snow will gradually melt into the containers. I have set myself the daily task of inspecting the above Harvesting Station, and removing any collected water to a large bucket next to the toilet bowl. Any floating debris such as leaves or twigs will be removed during this process, to minimise any blockages as it goes down the pan. Should we have excessive rainfall over a long period of time, to avoid overflowing and losing collected water over the sides, plans will be put into action to empty the receptacles more often. To implement this plan it will be necessary to ask around the neighbourhood for any unwanted empty large plastic milk bottles, to store the excess water. If not enough bottles are found then it will be necessary to rob the bottles from the plastics collection bank in Tesco car park. On no account must any water be lost, such is the value of this precious commodity. By my reckoning I predict that after a wet and cold winter of many weeks of heavy rainfall, I should be able to knock a full £5 off my water bill through severely limiting my use of tap water, in favour of using the free stuff which rains down on us all. What are you doing to keep your water bill low? Will you be following my example? PS. Thanks to Debbie, I have your address, I will be sending the bag tomorrow. The cost of keeping a pet can be very expensive, very very expensive if you want to feed them some of the more costly foods on the market. People who can afford to buy pedigree cats and dogs might not be bothered about how much cash they part with when it comes to choosing which gourmet food to serve up. 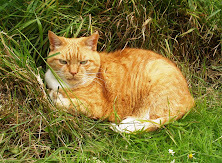 Animals with dodgy tums might need specialist food which can work out to be quite expensive. My cats are bog standard moggies, and get the run of the mill bog standard food. I would not be able to afford fancy food for a fancy cat. Like my own food, I also shop around when buying for my cats. 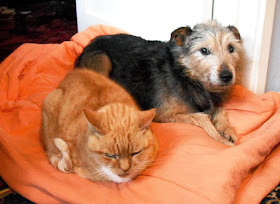 They are quite happy with Felix and Whiskas, my seventeen year old Bugsy has had a lifetime on Felix, and is still plodding around the house and garden in his own sweet way. 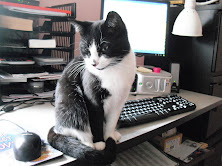 He has only had two visits to the vet in his lifetime, he has been a very healthy cat, so he has done ok on Felix. Today I have been out and stocked up, this little haul cost £74. I went online this morning and checked out where the special offers were. Pets At Home have Felix pouches on at £2.50 a box of 12. Sainsbury's has this on at £3 a box, in Tesco it's £3.68. I got the Whiskas pouches from Tesco at £2.50 a box. In Sainsbury's it's 2 for £6, in Pets At Home it's £3.69. The Whiskas dry 2kg bags were £3.50 from Tesco. At Pets At Home it's £5.49, and at Sainsbury's it's £4.49. So no contest. Other supermarkets within my town were checked. I never pay full price for cat food. The special offers rotate around all the supermarkets in turn, so I stock up when I can get it. This will last me a while, but when it starts getting low I will check prices again, and find the offers. The cat litter I am getting from Poundstretcher at the moment. This is a cheap clumping clay based one at £1 for a 10kg bag. It's a bit of a mixture when you open it, sometimes a bit dusty but I can put up with it. It's the cheapest one I can find, it's a bit like the supermarkets own brand which Tesco sell at £1.55. I have four litter boxes dotted about the house, two upstairs and two downstairs. They are just starting to use them again now the weather is cold and wet. I am sometimes woken up in the night by the pong of a freshly dropped poo which they haven't bothered to cover up. Yuk. Sweet little darlings, ha ha. I have to get up and move it. This is Mayze's preferred place to eat. Every time she hears me moving about in the kitchen she dashes in at 100 mph and dives onto the window sill. Her saucer is always there, ready for whatever morsel I might put onto it. She won't eat wet cat food, has the dry Whiskas from the bowl on the floor, and sometimes gets a little treat of cooked ham on her saucer. I did spend a little bit of money on my own food today. I was a bit early for the third markdown on the yellow stickers at Tesco, but I got a few with a second markdown, which was still a good saving. 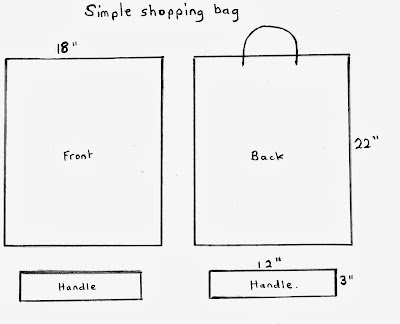 I've just done the draw for the make it yourself shopping bag. Ten names went into it. I did the eeny meeny miney mo thing, and Debbie in Canada was the name to come out tops. So, Debbie, if you send me your name and address either email, or in a comment which I won't publish, I will get it off to you pronto. You mentioned something about putting a logo on it, best to do that before you sew the two sides together. Well done, and thanks to everyone for taking part. It's very windy tonight, but I am snug and well wrapped up. No heating on yet, just the fleecy dressing gown over the top of my clothes. Hope you are snug where you are. We were let off lightly with the storms, they didn't get this far north. We had some rain and some wind, but nothing more than a blustery wet morning yesterday. Today the sun has been out though the temperature has dropped so there is a chill in the breeze. A vigorous walk soon warms me through. but look at them now. Flippin amazingly fantastic. Aren't they absolutely beautiful. There used to be a tree in this spot but it was cut down. and comes out here on the other side. No the fence hasn't been cut to fit around the tree, it actually goes through the middle of it. Fascinating. I went to the craft club yesterday and made a start on another patchwork project. I like contrasting colours so chose these two, I think they go together very well. I did a row of six squares, then started on another row. I realised that I had sewn the stripes the wrong way round, so I had to join it like this so all the stripes will be going in the same direction. Now I need to make five rows of five, and make sure I get the stripes right. Thank you to Elaine in the USA for sending me this pretty piece of fabric, and a little booklet with a sunflower story in it. The colours are lovely. Talking of sunflowers, I have taken all mine down today. They were looking scraggy after a battering from the wind. It looks a bit bare at the side of the garage now. All the big flower heads are saved and will be left to dry out. The birds might get them, or I might try and extract the seeds for myself. If it is a faffy job I might not bother. I've got more books to read from the library, and more sewing to do, so plenty to keep me busy. I need to go shopping soon as foods stocks are getting a bit low, also need some cat food. Tatty byes folks, catch you tomorrow, and thank you for the nice emails you are sending. 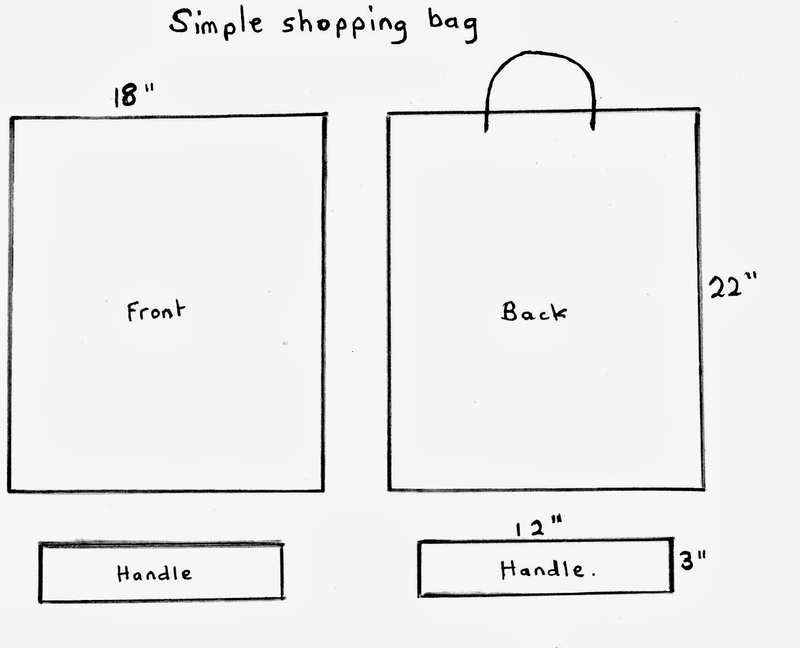 Make your own shopping bag. I do read all your comments and your emails, and I try and answer all your questions. If I forget please give me a nudge, because I can be absent minded sometimes. My brain is all over the place and I read something and think I will deal with that later, then I forget, and it comes back to me weeks later. 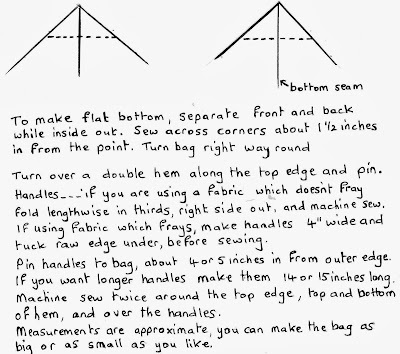 Anyway, Lane asked about a pattern for making a shopping bag. There are many different ways of making them. The blue bag in the picture, Love Free Stuff, has a gusset in it, making it like a box. There is an easier way to make one. First off you can use a plastic Bag For Life carrier bag as a pattern, which you can buy for 10p at the supermarkets. Just copy it, cut two pieces of fabric, back and front, and two handles. A bit like this. I have put some measurements in, but you can make it as big or as small as you like. Notes. 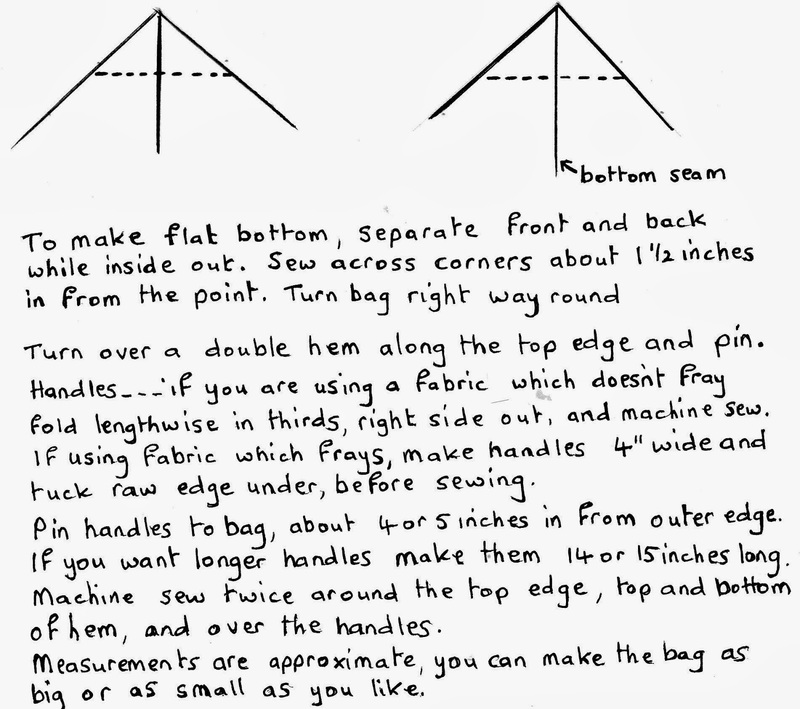 If you are using fabric which frays, sew the two sides together the right way round first, then turn it inside out and sew round the seams again, trapping the edges inside. If you want a neat job when attaching the handles you can tuck the ends inside the top hem before you sew around it twice. Thicker fabric is best, but not too thick or your needle will struggle to go through where there are several layers. If you use lightweight fabric your bag will be a bit floppy but you will be able to fold it up into a small bundle and put it in your handbag. Now I have a giveaway. I have cut two pieces of fabric and two handles for someone who wants to have a go at making their first bag. The edges don't fray so you will only need to sew the two pieces together once, right sides in. If anyone wants to win it, leave a comment. I will post it out to anywhere in the world. Closing date is Wednesday 3pm,. A name will be drawn out of a receptacle which I have handy at the time. This time you won't get a ready made bag, you have got to make it yourself. I'm not doing everything for you, ha ha. If you haven't got a sewing machine you could sew it by hand, but it will take you longer. Toodle pip. It was only recently when I wrote a post urging people to talk to their mother before it was too late. To ask her about her life, what she did, where she came from, and how she lived. I knew very little about my mother when she was a young girl, she told me stories but I have forgotten them, or I wasn't listening properly. My mum was born in 1918 in Hamburg, she was a young woman who lived through the war, in terrible conditions, she saw some terrible things. All I remember is that she lost her house in the bombings, she wandered the streets with her small son in a pram when Hamburg was flattened. It was by chance that I saw this book in the library. The blurb on the back said it is the spellbinding account of the life of a young woman in Hamburg during the second world war. I had to read it. Gretel Wachtel was born in 1915 and was 24 years old when war broke out, so she was three years older than my mum. The book is written by a close friend of hers, Claudia Strachan, who was also born in Germany, but moved to England in 1993. 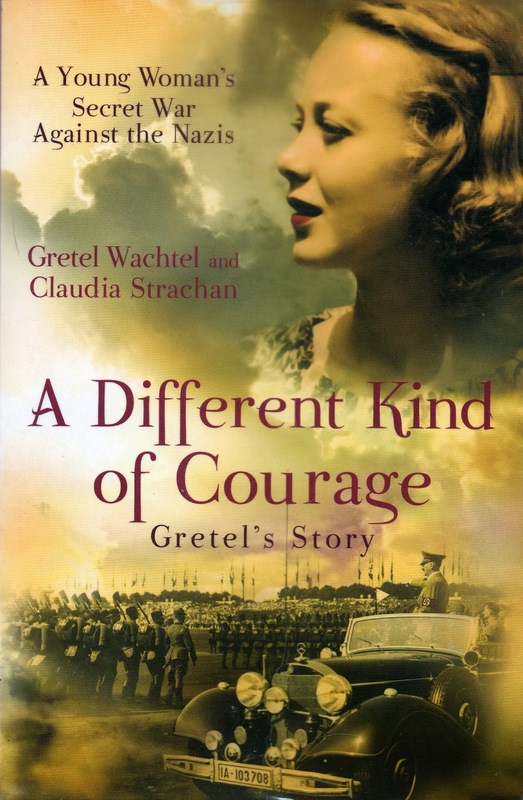 She spent the next nine years researching the historical background to Gretel's story. Gretel was a free spirited young woman living in a world where few dared to speak up. She was forced to work in an ammunition factory but she didn't lose the desire to fight the Nazi party. Gretel allied herself with the resistance, passing on secrets learned from her work, sending and receiving messages via the Enigma encryption machine. She was finally arrested by the Gestapo in 1945 and taken to an internment camp. She was liberated as the British Army advanced towards Hamburg. After the war she fell in love with a British officer and moved to England. While I was reading this book I could picture my mother living in similar conditions. The graphic descriptions of the bodies lying in the street after the bombings. Walking through the rubble. The struggle that she must have had to find food for herself and her son. Gretel had a thriving black market business where she bartered all kinds of things, and sent food parcels to the church for the Jews which were hiding there. My mum came to live in England. After meeting my dad, a British soldier, she thought England would be a better place to live, better than Hamburg. There wasn't much left of it. This book has painted a vivid picture for me, of the times and places where my mother grew up. It has sort of filled a few gaps. I was hooked to the end, and it's very easy to read. Gretel died at the age of 91 after a long marriage to Patrick, she lived in the south east of England. I am so pleased that she shared her story. This is a review I have copied from the Amazon site. It's from her son, Patrick. I am biased, it is about my mother but the stories told to me as a child are all the more remarkable when written in this way by Claudi. A moving story, one I am personally proud of and grateful to the Author for her efforts in making it public. Read it, it's good! My review, it's a fascinating insight into the life and suffering of the German people during the war. Her courageous acts of defiance and bravery as she went about her everyday life, were amazing. I found her story inspiring. I've just had a couple of glasses of wine and I am yawning my head off. That's what alcohol does to me these days, sends me to sleep. Party animal I am no more. Mind you I have had a busy day, I've done four dog walks, for friends who are a little bit incapacitated at the moment. My elderly friend had a fall, and can't walk very well, so I am taking Bailey the poodle out for her. There's Lady to walk, while my friend gets over his op, and the little terrier from up the road gets a walk as well. All that fresh air is doing me good and keeping me fit. Anyway, what else did I get from the house clearance skip. This rail for hanging garments comes in four pieces. It will come in handy for when we do car boot sales and want to sell clothing. Easy to assemble and very sturdy. Look at this, 75 metres of hose pipe, brand new, originally cost £20. It was bought as an irrigation system for outdoor pot plants. Not that I need a hose pipe, I thought I would try and think of another idea for it, maybe an arty sculpture for the garden. Think outside the box, it's not just a hose pipe. Lots of plastic bowls. Useful for collecting rainwater for flushing the toilet. Some of them have holes drilled in the bottom though, so they can be used as planters. Or maybe I can make a sculpture out of these as well, ha ha. Boxes and boxes of books. We can sell these to raise funds for our cat rescue. There are also picture frames, photo albums, a chess set, some paper plates. and an air bed. I might keep the air bed, because the one I have got which is identical to this one, is ancient and has sprung a leak. A good haul I think. I had a surprise visit today from some lovely friends. They sold up in our village and went to live in Spain for a while. Then they went to Canada, now back here to visit, then off to Spain for a month, and back to Canada for Christmas and New Year, and eventually settling in Norfolk early next year. It was great to have a catch up with them, a lovely surprise that they dropped in to see me. Hopefully I will be going to visit them in the spring when they have finished their globe trotting. Something to look forward to. Have a nice Sunday. Don't think the weather forecast is too good, batten down the hatches I think. DON'T FORGET TO PUT THE CLOCKS BACK ONE HOUR TONIGHT. WE GET AN EXTRA HOUR IN BED, YIPEEE. As you might have guessed by now, I absolutely love free stuff. I love it that I am given stuff, I find stuff, and I gratefully accept stuff, from people who want to give away their stuff. I also give away my stuff that I no longer want or need, I give it to charity shops. Stuff should be mobile, it should move from person to person and from house to house, and be used until it is no longer fit for purpose. If possible, new stuff should be made from old stuff. Stuff should be re purposed, re worked, re designed, and re used. When it is broken it should be repaired if possible, or taken apart and used for another job. Take my shopping bag for instance, I made ten of these from a gazebo roof that I found in a skip. It was the end of a caravan show and one of the traders had dumped their gazebo because the frame was broken. I fished it out and brought it home. My shopping bags will out live me, and hopefully get passed on to someone who can use them. This morning I walked past a house with a skip on the driveway, they were having a clear out. Me being nosey I stopped to chat and have a look at what they were throwing out. An elderly relative had moved into a care home and they were clearing the house. This galvanised potting table was on the lawn and they said I could have it. Wow, that was lucky, I went home and got my car out to pick it up. Then there was a hose pipe, and a garden tool, don't know what it is but I will pass it on if I can't find a use for it. Isn't it a smashing little table, perfect, just the job. Then they said there is an office chair if you want it. Yes please, I love office chairs. I love the way you can push them around the room to wherever you are working. They are much more comfortable than an ordinary straight backed chair which you have to lift to move. There is a damp patch where the rain dripped on it, but that will be dry in a day or two. It's like new, no signs of wear and tear. I am pleased with my new second hand stuff. Yesterday I took a box full of stuff to the Age UK shop, so some out some in. There is no need to buy new stuff these days, most things you can get second hand if you are not in a hurry and look around. My lunch today was done on the cheap. I bought a cauliflower yesterday, and made some soup with the leaves. I added two dessertspoons of porridge oats, a veg stock cube, shake of curry powder, and a dab of garlic puree. Eaten with a slice of wholemeal bread. Very nice and very cheap. I'm off back down the road to see what else they are putting in that skip, they said to come back later and have a look. I love free stuff. Things I have spotted while walking about the village. I like to keep my eyes open and my camera in my pocket, just in case I see anything of interest. Just look at these beautiful fungi. Is that the right word, or are they mushrooms, I'm just guessing, I don't know what they are called. Natures works of art, aren't they lovely. We have an abundance of red berries around here. It's lovely to see a splash of colour. This tree has got almost no leaves left, but has huge bunches of berries weighing the branches down. Bet you want to know what I had for my lunch today, don't you, go on ask me. Oh alright then, I'll tell you. two scrambled eggs 33p, packet of noodles 12p, the last bit of an iceberg lettuce, about 10p. Add that up, 55p, that will do. I needed to go for a walk after that, phew, it was very filling. I've been thinking about what my next crafting project will be. I could be getting the patchwork bug, I might make some cushion covers, to replace my rather boring ones. Hmmm, will think about it. And now.....the moment you have all been waiting for, the first public viewing of my first ever completed bed quilt. Cue fanfare. A few facts and figures, the template for each patch was 10cm square, reduced to 7.5cm after the hemming. There are 625 patches, all hand sewn together. I started by making the four squares for the centre, joining them together with the red border. Then I kept adding more rows, alternating with a plain border, then a patterned. So, I added the plain pink and the plain green, followed by another patterned border. By this time I was getting a bit weary and wanting to see it finished. After checking the size on the bed I decided to add a second patterned border, and finish off with a plain pink binding. I could have gone on a bit longer and added more so that it drapes a bit lower on the bed, but I think this length is fine. It looks nice with the rag rug next to it. I hung it on the wardrobe to get the whole thing in the photo. As I mentioned in the previous post, the back is a duvet cover I bought from the Age UK charity shop for £1. This also gave me the pink binding for the edge. Sandwiched in the centre is an old candy striped flannelette sheet. A few close ups. I decided to go over all the plain squares with the machine. That was easy enough for the pink and green stripes, just do a zigzag twice over them. A bit more difficult to do the centre squares, a lot of stopping and starting, and changing direction, and a lot of securing the trailing cottons on the back. I think if I was to do something like this again, I would machine over all the squares from one edge to the other. Never mind, I like the look of this finish so I suppose it was worth the effort. I already had most of the fabric, pillow cases, curtains, clothing. I spent a couple of quid on two shirts and a skirt and pj bottoms from charity shops and car boot sales. I took the easy way out for the corners, just squared them off. The pink binding I machined on from the front, but finished with hand stitching it to the back. The back is actually yellow with pink flowers on it, the colours have not come out well in this photo. You can see the ends of the cotton tied off when I had to stop and start. I am very pleased with it. I shall be keeping it because it is a lot nicer than the bedding I already have. Two of my throws have seen better days and are ready for the rag bag. After 30 years I am sick of seeing them and they are really scruffy. My bedroom will look lovely now. Finally it's finished. Today I stretched the table out and added the extra leaf, to accommodate the whole quilt so I could work on it more comfortably. I scrounged this table from my neighbours a few years ago, they threw it out because it had a broken leg. I with my screwdriver mended it. Free table. I think Heidi cat is trying to change channels, she doesn't like this programme very much. 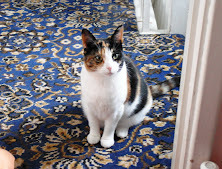 This is Watchdog, she thinks it should be called Watchcat, ha ha. While I have been sewing I have watched four episodes of Steptoe and Son, some old Brookside episodes, old Coronation Street, and some rock and roll videos. Sadly it's too late to take some decent photo's, but here is a close up taken with the flash, to give you a taster. I will take some of the whole quilt tomorrow in daylight. Catch you tomorrow. Toodle pip. Lots of rain today but at least it's not cold. All the cats are in, asleep in different parts of the house, they have their favourite spots. Heidi has decided she rather likes the snugliness of the new quilt, I had to move her because I want to work on it. First I cut four pieces from the duvet cover, ten inches wide, for the binding. I folded it in half lengthways and ironed it flat. Next I machine stitched it to the four edges putting the folded edge onto the patchwork squares. At this point the middle and back are just pinned down, these will get enclosed in the binding when I fold it over to the back and sew it together. I did think about using the machine again for this, but I think it will spoil the look of the front if I don't get the stitching just perfect, so now I am in the process of hand sewing the binding to the back. Time consuming but a much neater job. The show last night was fantastic. It's billed as a Rock and Roll Pantomime and is said to be one of the best touring production shows. 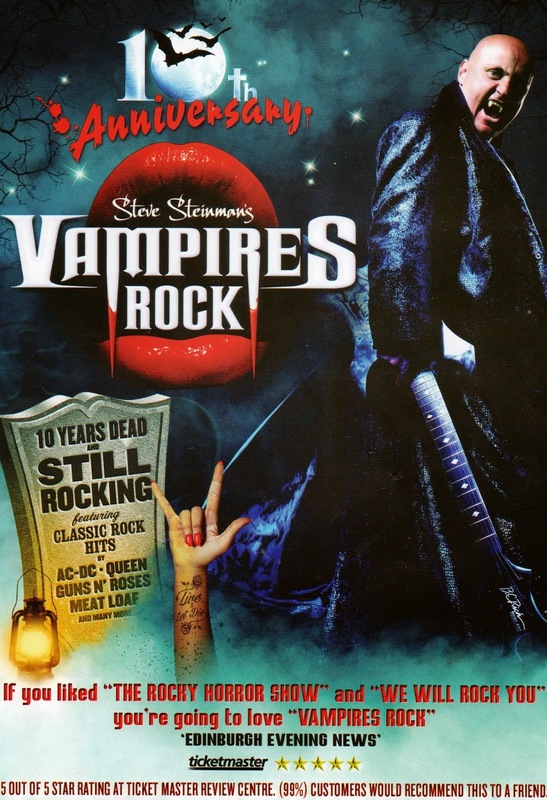 It's in it's tenth year and once again Steve Steinman plays the evil Baron Von Rockula, owner of the Live and Let Die club. In search of a new bride the Baron must convince Pandora who auditions for the new singing position, to cross over to the dark side, and live forever in Rock n Roll Hell. The cast of singers, dancers, and band, were brilliant. The stage sets were amazing, fireworks, flame throwing, and flashing lights. It was full of classic rock hits that got us all up on our feet . It's the only way to watch, impossible to sit in your seat, just got to dance. Steve Steinman has a powerful voice, he does some Meatloaf numbers which were just perfect. The lead guitarist did a solo at the front of the stage right above where I was sitting in the front row. Throwing his head around in a frenzy, his wild long hair thrashing around, his face made up to look like a vampire, when all of a sudden there was a splurge of blood pouring from his mouth, it ran down his chin and onto his chest, it looked amazing. Later on in the show, the two lady vampires bit into the neck of Pandora and emerged with blood dribbling down their chins and it went all down Pandora's white dress. The effects were amazing. After the show some members of the cast came into the foyer to sign autographs. I didn't see Steve Steinman however, someone said he did make an appearance but he didn't stop long. A bit disappointing I thought. These two girls were fantastic dancers. The leading lady singer had an amazing voice, by herself as solo, and doubling up with Steve. Now this chap was brilliant. He was the comedy character, he played the drunk when he first came on stage, he was acting the fool, so funny. Then he got to sing, and he had an amazingly powerful voice. I think he should have had more songs to sing. The dancers looked so happy and put such a lot of effort into it, they did their vampire impersonations so well. Looks like she has taken her fangs out now. There was a stand set up to buy merchandise, which wasn't doing a big trade as the theatre was only about two thirds full. They've still got a lot of dates left to do and seem to be criss crossing the country from now until well into next year. If you are a fan of rock and roll I can say this is a great show to see. Must get on, want to finish the quilt. Catch you tomorrow. Toodle pip. Oh, and before I forget again, welcome to the new followers. I see there are now 666, you little devils, ha ha. A boring job but it has to be done.